Wine? On the house? For me? Yes please! That was generally along the lines of my response when I was asked whether I would like to sample two bottles of Chablis Wine and come up with some suggestions of what kind of food I thought would go well with Chablis. I am a firm believer in drinking quality wine rather than large quantities of wine and so I was excited to have the chance to spend some time drinking some delicious wine and thinking about how to pair the food to suit the flavour of the wine. Chablis is a white wine produced in Burgundy in the northern regions of France, in an area neighboured by the great wine region of Champagne. 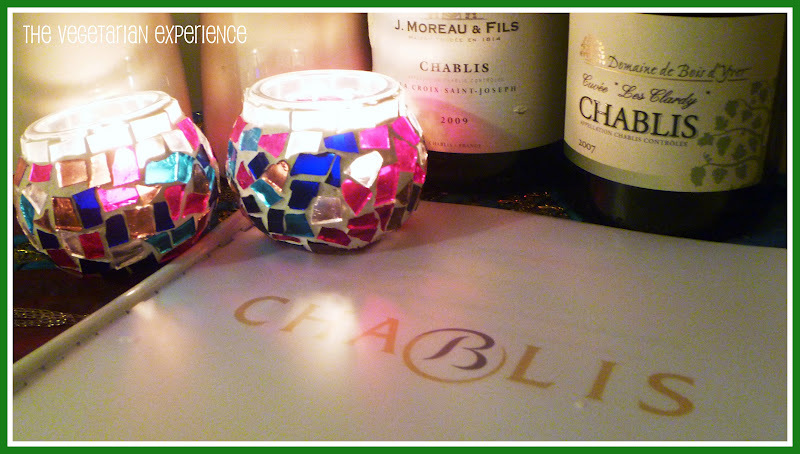 The name "Chablis" originates from two Celtic words - CAB which means "House" and LEYA meaning "near the woods". It is believed that this area of Burgundy began producing wine seventeen centuries ago in Roman times when 4 Villas began cultivating vineyards in the area. Fast forward to the twenty first century and now over 300 vineyards operate in the Chablis region, producing over 10,000 bottles of wine per year. 3 bottles out of every 10 are sold in the UK. 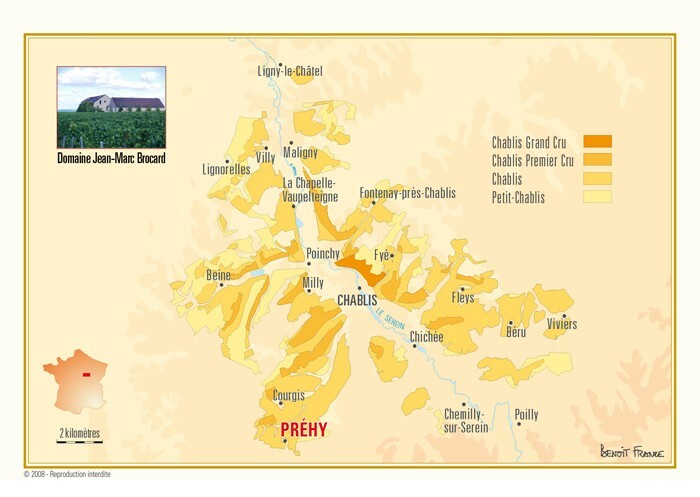 Chablis is made 100% from the Chardonnay grape and is considered by some, as one of the "purest" wines available due to the simple wine making style of the Burgundy region. Best served at between ten and twelve degrees celsius, Chablis contains a high acidity thanks in part to the genetic make-up of the land the grapes are grown upon. Fossilised sea shells make up most of the lower soil strata and the grapes, grown on steep slopes are infused with the hints of chalk, minerals and the sea. Even though I have indulged in some wine tasting before, I am still a bit flummoxed when it comes to picking wine from the supermarket to pair with food, so I was interested to see how the wine I received would compare to others I had tried before. So how does one go about tasting wine? Appearance - Hold the glass by the stem or the base and look at the wine - is it clear and bright? White wine ages darker with age. Swirl the glass and watch the droplets or "legs" - these indicate the alcohol content. The greater the legs, the greater the alcohol content. The speed of which the legs fall also tells you if the wine is sweet (slow) or dry (fast). Palate - Take an initial sip and try to link the taste with your sense of smell. Draw air through your mouth, like taking a mouthful of spaghetti. The taste should intensify. Now think about how long you can taste the wine for: the length of the wine, counted in seconds will indicate the cost of the wine. Apparently, the longer the taste lasts, the more expensive the wine is. 2-3 seconds is short 5-6 seconds is medium and 10 plus seconds is long. I will remember that the next time someone buys me a bottle of wine! So with the kids firmly tucked away in bed and after a refresher of how to best taste wine, hubby and I set about uncorking the wine and getting on with some tasting over a couple of evenings. Chablis J Moreau is a crisp, clear, dry Chablis. This wine was quite a young wine, only two to three years old and this was reflected in the taste. The wine tasted very light and creamy and felt like a very smooth, drinkable wine. It's pale to medium colour reminded me of apples and minerals and invoked memories of the sea. Although I found this wine smooth and creamy, hubby said that he found this wine quite acidic and sharp. He still drank a couple of glasses of the wine, it just invoked different flavours for him - which just goes to show that wine affects everyone's taste buds differently! This was a very drinkable wine and I can imagine it would go down very easily on a warm summer's day. The Domaine Bois d'Yver Chablis is completely organic, which I was really surprised about, especially as it is so reasonably priced for an organic wine. In my opinion, this wine is a clear bright, gold coloured wine with hints of apple, apricots and herbs and a slight hint of oak. I thought that this wine had a medium body, medium length and tasted medium-dry. I thought that this wine was delicious and I actually preferred this wine to the other as it was two years older and had a fuller, more distinct flavour. Hubby enjoyed it too as he also said it had more depth and flavour. We felt that this wine also complemented the food we ate much more than the other wine - although that could be to do with our pairings rather than the wine! This is a really good example of a Chablis and one which we would definitely purchase for ourselves. 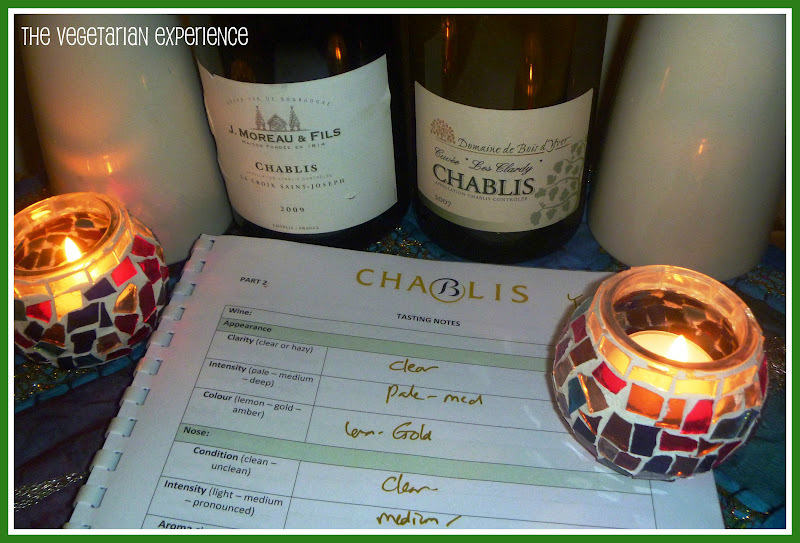 So moving on from the taste of the wine, which food would pair well with Chablis? In my younger days I used to indulge in some Waitressing every once in a while. It was often interesting watching people trying to choose wine from the wine list to complement their food. The most popular wine people would order was the one listed just above the house wine - yes the house wine would have made them look like cheap skates and so the one above made them look like they really knew their wines! I worked for a chain pub-restaurant, and so our training on wine was pretty minimal, albeit non existent. Generally, it boiled down to the old adage of "Red Wine goes with red meat" and "White Wine goes with white meat or fish", and that is pretty much what people stuck with. However, this does discount a whole group of food and people..... Yes, what about Vegetarians? It seems that Vegetarians are completely overlooked when it comes to wine tasting as often wine seems to be geared up to being paired with poultry or fish, and certainly wine marketing in the media seems to point towards this. 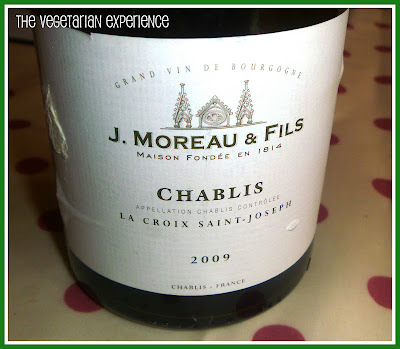 So to add a different angle to our wine tasting, and as this is a Vegetarian food blog, I decided to set about discovering which vegetarian food would pair well with Chablis wine. How does Vegetarian food pair with wine? Rather than thinking in terms of red meat and white meat, the vegetarian equivalent seems to be thinking in terms of Green Vegetables and Brown Vegetables. It is said that White Wine pairs well with Green Vegetables and Red Wine pairs well with Brown Vegetables - a strange logic I know, but bear with me! Additionally, I have always known that fine wine improves with age but I have often wondered whether you should pair different foods with different bottles of wine according to their age. Well apparently, Yes you should! The weight of the food needs to balance the weight of the wine. Therefore, a "young" Chablis will suit simple food whereas an older Chablis will suit a richer food. It is also suggested that some kind of Fat or Oil needs to be present in Vegetarian Food to make it wine-friendly. Chablis pairs really well with soft cheese and so a dish with soft cheese, or a creamy dish containing butter or olive oil is said to complement Chablis well. So to summarise: What do we need to think about when pairing Chablis with Vegetarian Food? 3) Prepare simple food for young wine and richer food for older wine. 4) Potentially consider pairing like foods and wines from the same regions and countries together. As well as thinking about dishes already in my repertoire, I also wanted to put my skills to the test and create some new vegetarian dishes which would pair well with Chablis, and which we could sample alongside the wine I had been sent. So with my research of pairing wine with vegetarian food in mind, I created a snack/starter, a main course and a dessert to complement the Chablis. Hubby and I matched the Chablis J. Moreau & Fils 2007 with an Italian Bruschetta. 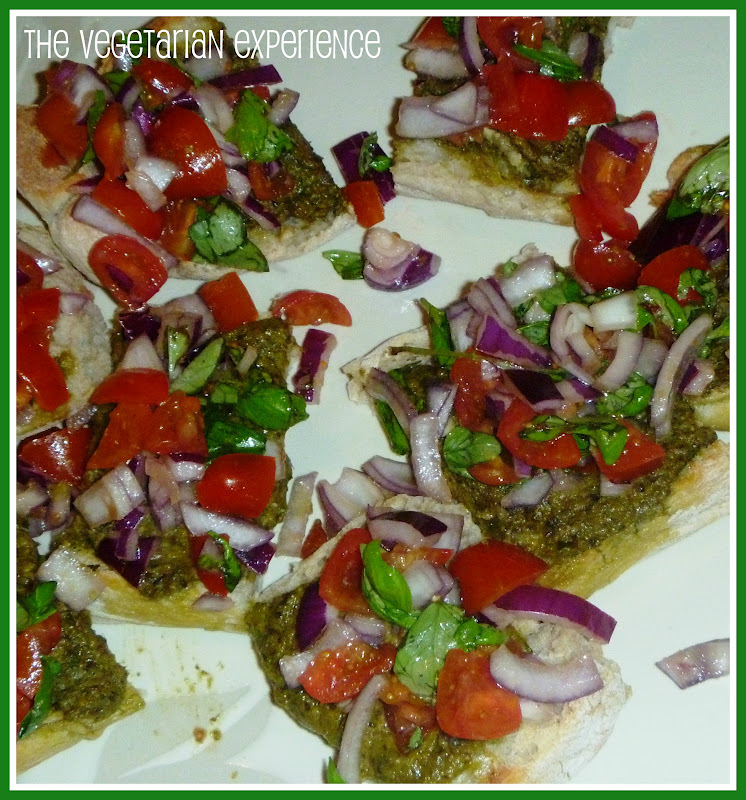 This was a really quick and simple dish comprising of ciabatta bread, vegetarian pesto, tomatoes, red onion, basil & a drizzle of olive oil. The saltiness of the tomato and onion, the herby flavours of the basil and the acidity of the pesto meant that the wine went really well with this dish. We ate the Bruschetta on it's own as a snack, but it would also make a great starter as part of a meal. The following evening, we paired the Domaine Bois d'Yver Chablis 2007 with a main course of Brie, Asparagus and Caramelised Onion Tart. 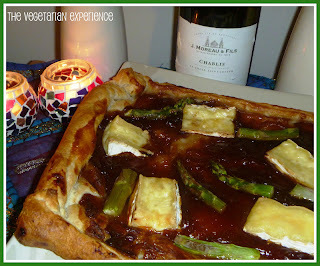 Again a really easy dish - ready to roll puff pastry, smeared with caramelised onion chutney, with asparagus and brie placed over the top and baked in the oven. I was very excited about this pairing as I have developed a slight penchant for brie lately and I thought that the Brie and Onions were suitably "french" and would complement the wine, and they really did! 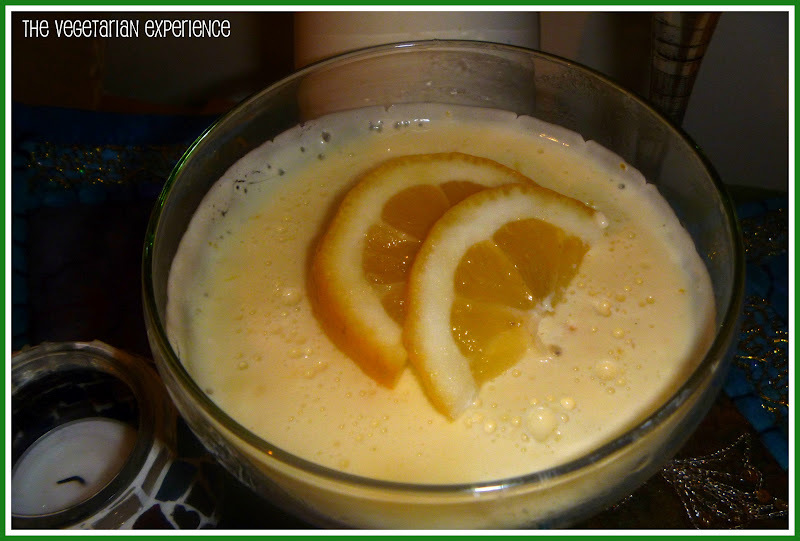 In an attempt to pair Chablis with sweet as well as savoury, I made a Lemon Posset with lemon, cream and caster sugar. As well as being delicious, the Lemon Posset complemented the Chablis beautifully. The taste and smell of the Lemon went really well with the hints of apple and apricots in the wine and this creamy, light dessert, when paired with the wine, brought the meal to a lovely conclusion. So there you have it, some of my ideas of what to pair Chablis wine with. I hope you have enjoyed reading this post as much as I enjoyed researching, writing and cooking for it. I would like to challenge you now to break the mould and entertain the thought (if you haven't already) that Vegetarian food pairs well with wine, and that wine does not necessarily need to be served with meat or fish to be enjoyed! Disclaimer: I was sent two bottles of Chablis wine in consideration for review and this blog post will be entered into a competition to win a two day trip to Chablis offered by The Bureau Interprofessionnel des Vins de Bourgogne (BIVB). Any views expressed in this post are my own. 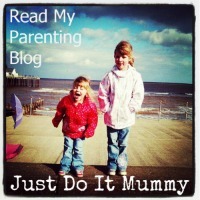 I did enjoy reading this post but probably not quite as much as you enjoyed writing it. I think we will definately buy the second one. What a nice assignment for you! Thanks Sheffy. Let me know how you get on with the wine!